1Felix Ndagijimana became the first Rwandan director of the Fossey Fund’s Karisoke Research Center in January 2012. 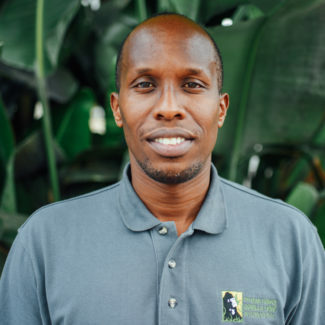 He oversees all of Karisoke’s research and protection programs in the Volcanoes National Park and outreach programs in communities surrounding the park, as well as managing the Fossey Fund’s partnerships in Rwanda. He leads a staff of more than 100, including trackers, anti-poachers, research assistants, and administrative personnel. Felix joined Karisoke as a research assistant in 2004 and served as deputy director after earning a master’s degree in primate conservation from Oxford Brookes University (UK) in 2008, on a scholarship created by Fossey Fund supporter Mary Ann Parker in honor of her son John Eric Peckham.